Flexible manufacturing at its best! We can punch any diameter hole, rectangle, shape, angle, or contour. 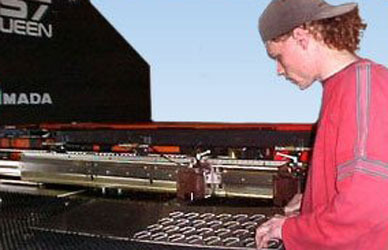 Programs are created using Metalsoft Fabriwin. Our state of the art turrets can accommodate sheets up to 4 feet x 12 feet with a maximum sheet thickness of 1/4 inch, and a wide variety of tooling shapes. Up to 33 ton punching capacity.